This racing inspired TAG Heuer chronograph timepiece is from the Formula 1 collection and is powered by the powerful Calibre 16 movement. Features a black perforated rubber strap and a stylish stainless steel case with tachymeter bezel. The matt black dial with date window at 3 o'clock along with three sub dials offers the ultimate racing technology. 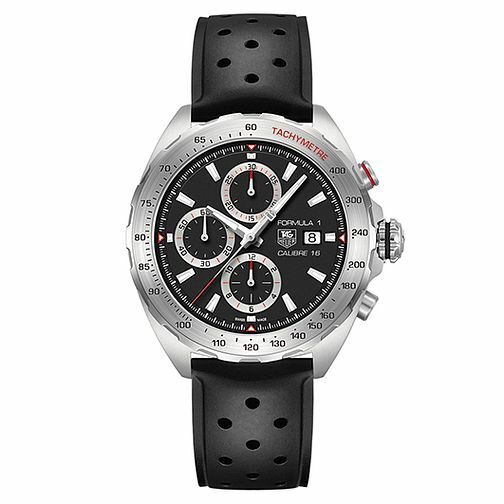 TAG Heuer Formula 1 Men's Chronograph Black Strap Watch is rated 2.3 out of 5 by 3. Rated 1 out of 5 by Anonymous from Timer function broke after 5 weeks Although watch looks great as do most tags, after five weeks I noticed timer function stoped working. Both side buttons had somehow stopped functioning. Not the quality you would expect from tag.